Princess Leia returns for an all-new adventure in this thrilling upper middle grade novel. Set between Star Wars: The Empire Strikes Back and Star Wars: The Return of the Jedi, the story follows the warrior princess as she leads a ragtag group of rebels on a dangerous mission against the evil Galactic Empire. Hidden in the story are also hints and clues about the upcoming film Star Wars: The Force Awakens, making this a must-read for fans old and new! One of a trio of middle grade books released as part of Force Friday and the Journey to Star Wars: The Force Awakens publishing initiative (the others are Star Wars: The Weapon of a Jedi: A Luke Skywalker Adventure and Star Wars: Smuggler's Run: A Han Solo Adventure), Cecil Castellucci and Jason Fry's Star Wars: Moving Target: A Princess Leia Adventure takes place between the events of Episode V: The Empire Strikes Back and Episode VI: Return of the Jedi and finds Princess Leia and Nien Nunb on a dangerous mission trying to distract the Empire by creating a false trail for them to follow. This is the longest of the trio of books, and it clearly took advantage of that fact. 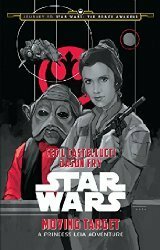 I thoroughly enjoyed this volume the most; we are given some real insight into what drives Leia and what frightens her about the responsibility that she has placed on her. I think this book had a certain level of gravitas that the other two are missing; we are clearly shown the struggles and sacrifices that the Rebels are making in order to defeat the Empire, and how deeply this affects Leia. I think this is why I found this one shining over the other two, as we are really shown the cost of the war in this volume. Moving Target is marketed as a middle grade book but I think it deals with the most mature content of the three volumes released in the trio. While I don't think it is inappropriate for the age range, it still handles some heavy material, but handles it well. For me, this was clearly the strongest of the three volumes, followed by Smuggler's Run and then The Weapon of a Jedi. A note on the design of the book: All three of the middle grade books are packaged similarly, each set up in three parts with a prologue and an epilogue. Before each section there is an illustration by Phil Noto that is presented in greyscale with red highlighted areas. The red is reflected throughout the chapter openers, as well as the dust jacket covers and the boards of the book. The entire thing comes together in such an impressive package. I'm hoping that if they do anymore middle grade adventures of other Star Wars characters that they keep this same packaging throughout, as it is top notch.